The WeaponR engine damper helps reduce engine motion when torque is transferred from the engine to the wheels. 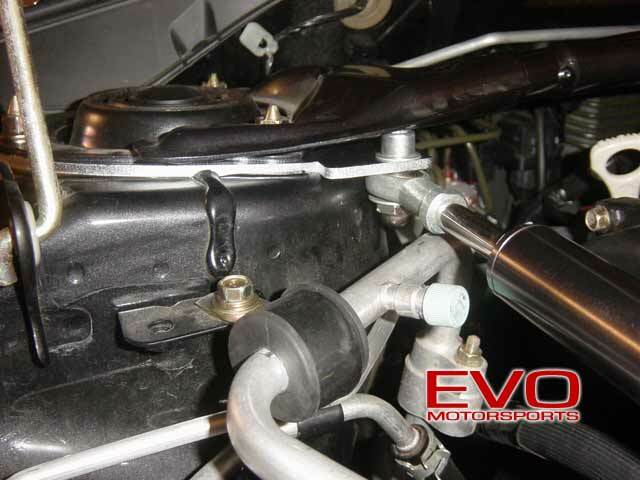 This reduction in "flex"can translate into quicker power transition, better shifting and makes life much easier on the motor mounts and exhaust system (especially for those with no flex pipes). 1. 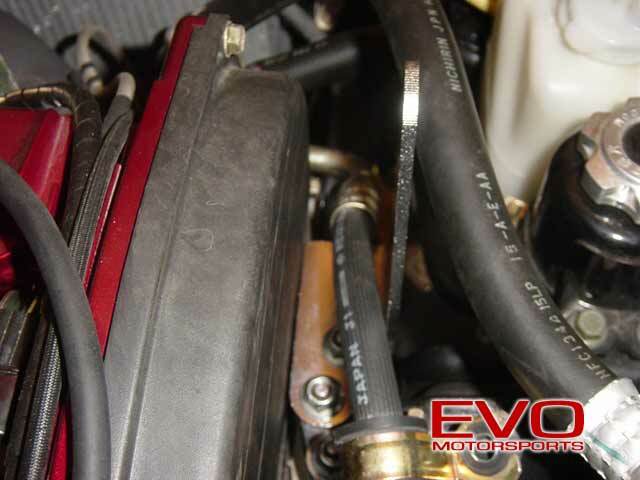 A jack should placed under the reinforced area of the oil pan to slightly support the engine. 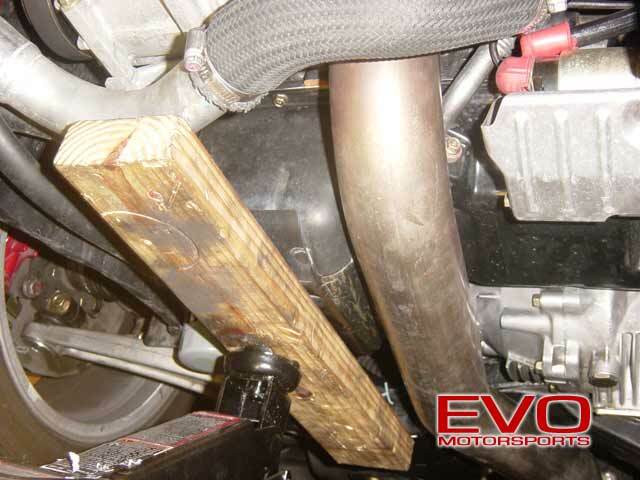 Place a piece of wood between the jack and the oil pan to spread the load and protect the pan. Only raise the jack enough to not be loose against the oil pan. 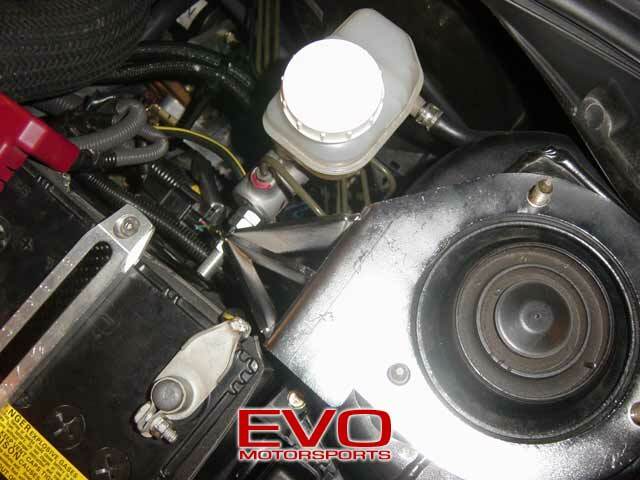 The jack doesn't need to support the full weight of the engine, it is only a safety precaution. 2. 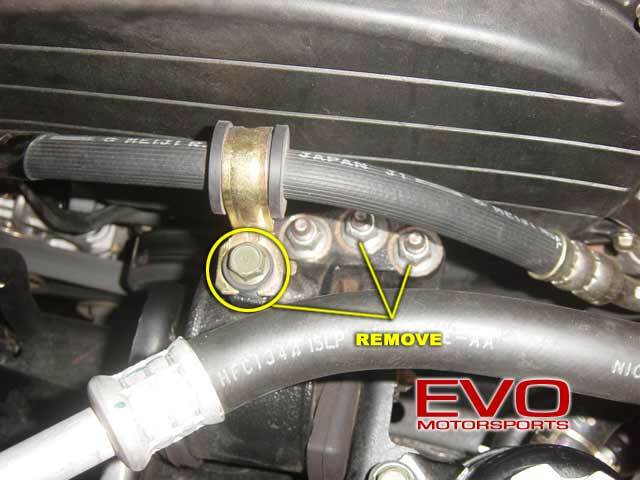 Remove the 12mm bolt holding the power steering hose to the top of the motor mount (circled) to make room to reach the two forward-most 14mm nuts (noted in the pic) on the passenger side motor mount. 3. Install the 2x20mm washers onto the studs of the motor mount. These take up the space of the recess where the nuts went and allow the bracket to sit flat across the top of the mount. 4. 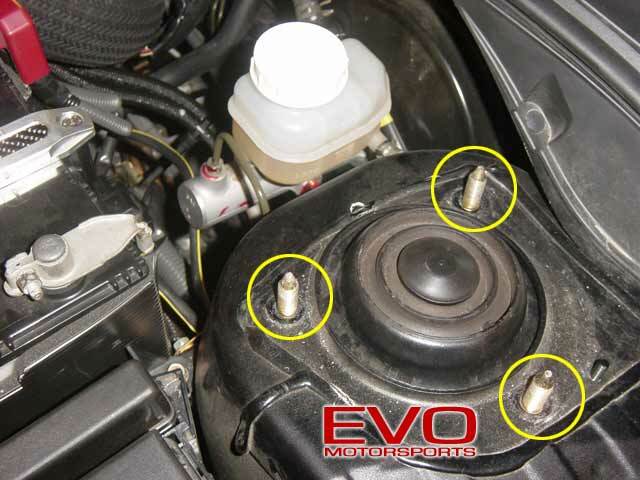 Install the damper bracket as shown, using the original motor mount nuts removed in Step 2. Torque the nuts to 50 FT-LBS. 5. Remove the three 14mm nuts on top of the passenger side strut. 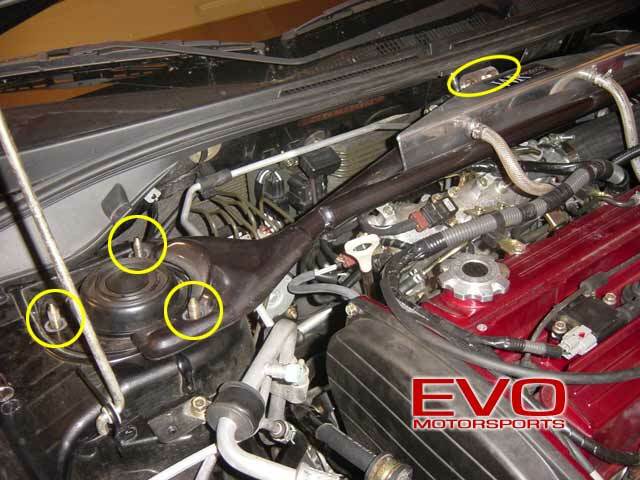 If the strut bar is installed, it will need to be removed: remove the three 14mm nuts on top of each front strut, as well as the 14mm bolts that hold it to the firewall. 8. The damper bolt under the strut bar is really close and will likely make contact with the bar when it's bolted down (bottom). While this won't particularly be a functional problem, replacing the supplied allen bolt with an appropriate grade bolt that has a shorter head would be a nice solution. 10. To make some clearance, we simply removed the bracket holding the A/C line, flipped it over and reinstalled it. That pulled the A/C line down and to give adequate clearance (bottom). 11. 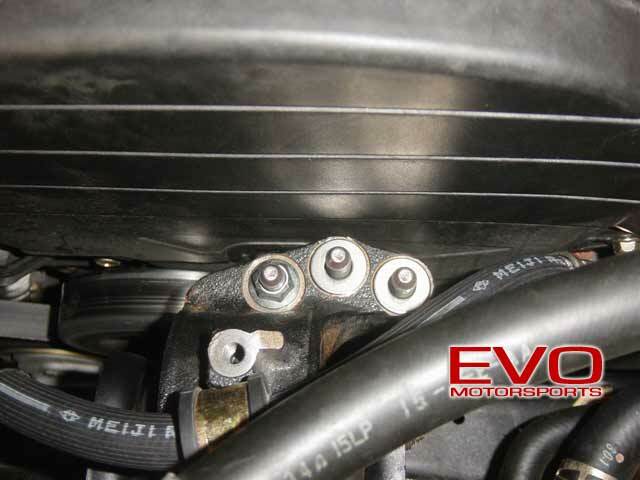 The other location is around the front damper bracket where the power steering hose is very close to a sharp edge. As much as we tried to keep the hose away from the bracket, it always wanted to settle back towards it and stayed a little too close for us to be comfortable with. 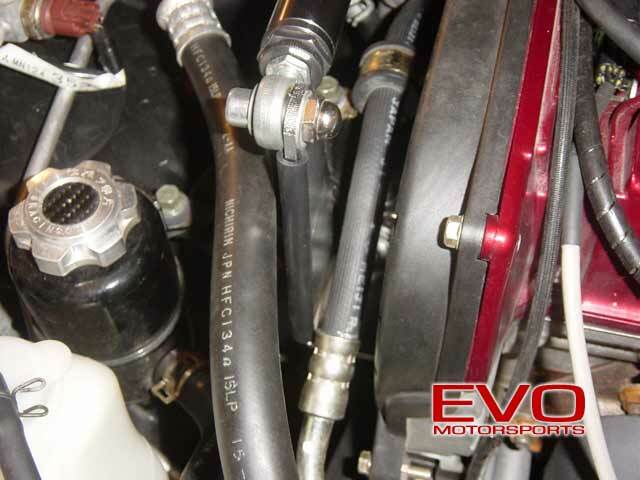 To eliminate any potential cutting edge on the bracket, we sliced a piece of vacuum hose length-wise down one side and installed it over the entire front edge of the bracket as shown. A piece of split loom would work just as well. 12. If only installing the engine damper, replace the strut bar and bolt down the three 14mm strut nuts on each side. Torque them to 32 FT-LBS. 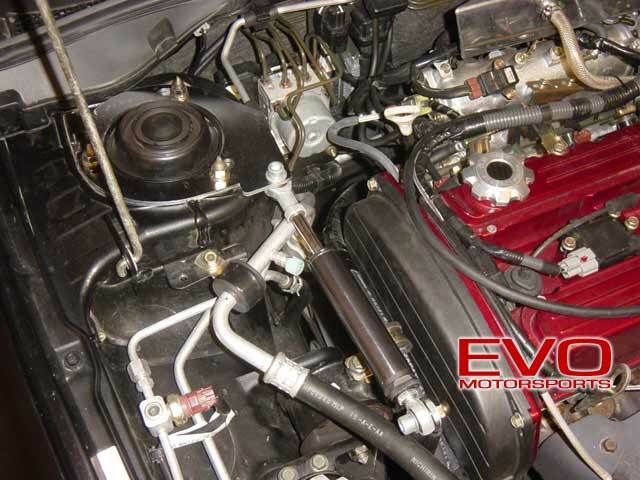 If installing the master cylinder brace as well, leave the strut bar off and install it when done. Remove the jack from under the oil pan. 13. 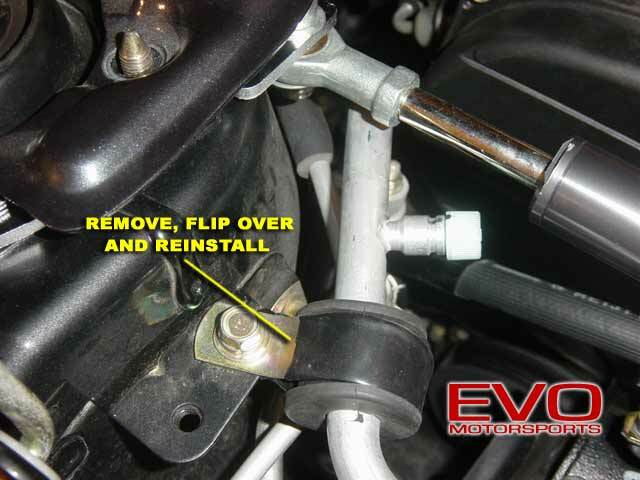 Installation of the master cylinder brace is extremely simple. Remove the three 14mm nuts at the top of the driver side strut. 14. 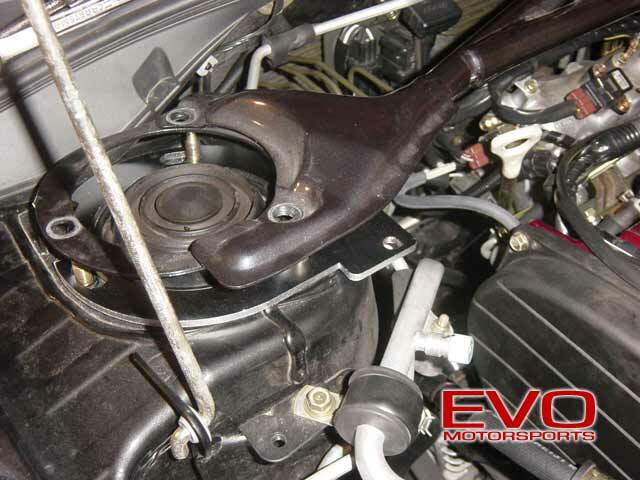 Make sure the bolt and lock nut are installed in the brace and install the master cylinder brace on the strut bolts. 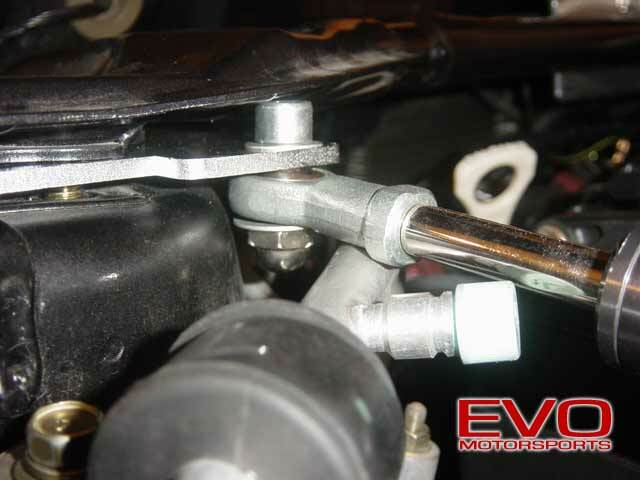 The bolt on the end of the brace should align directly in front of the master cylinder. 16. 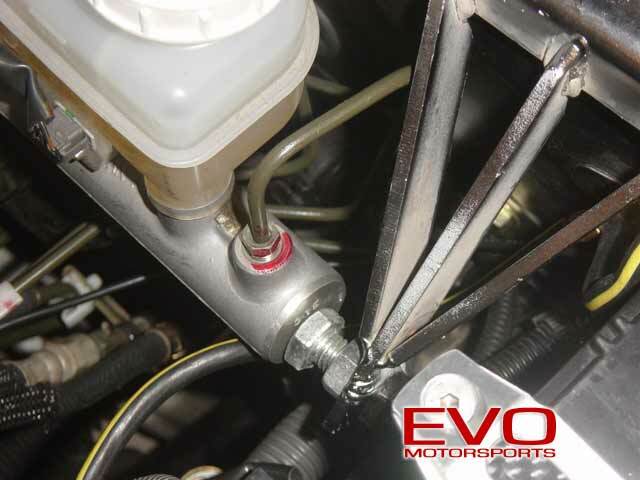 Using two 17mm wrenches, back the bolt out until it is firmly against the master cylinder and then tighten the lock nut to hold it in place (bottom). 17. Reinstall the three 14mm nuts on the passenger side strut (32 FT-LBS) and the two 14mm bolts that hold the strut tower to the firewall and you are done! We noticed much improved shifting immediately after this installation. 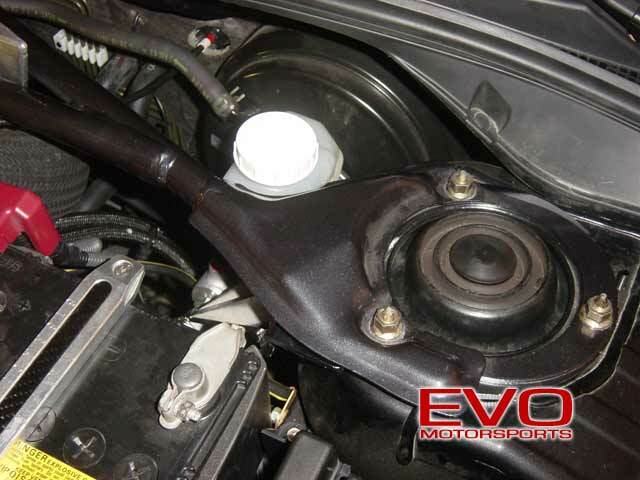 What is nice about the damper compared to filled or poly motor mount inserts is that there is no noticeable vibration transferred into the car.